You’ve seen it used on TV and in movies, but did you know that airbrush makeup is gaining popularity in home use as well? First used in the movies in 1958 on the set of Ben Hur, where it was used to “tan” armies of Roman soldiers, today it is the basis for many “sunless tanning” products available for purchase on the shelves of your local drugstore, or convenience store. With the evolution of high definition TV in recent years, it has become the new norm in the television and film industry as a replacement for powdered or traditionally applied liquid makeup, because it provides a significantly smoother finish. Airbrushing is gaining tremendous popularity both onscreen and off, as home airbrush kits are becoming more commonplace. But why all the buzz? What has professionals and private consumers raving? 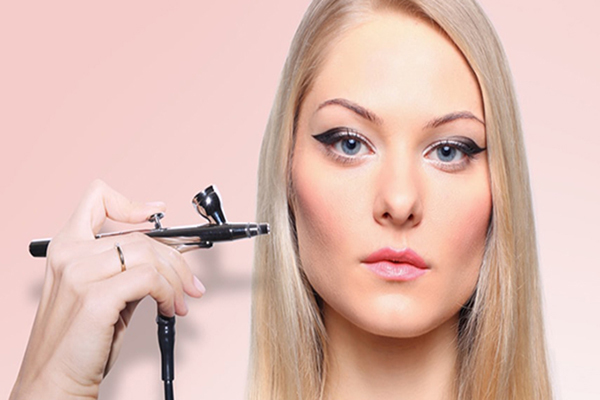 While promises, claims and questions abound, two characteristics of airbrush makeup definitely rise to the top of the debate and separate it from its competitors. While other advantages include speed of application, longevity, and durability, the true advantage of airbrush makeup is the beautiful finished result it produces.And, that certainly seems to be the leading reason for its immense popularity in the television industry; it boasts a significantly superior ability to hide imperfections, while maintaining a natural, non-made-up appearance. It’s also longer lasting, and won’t rub off or cake like powdered makeup does, which causes it to be very much in demand for weddings and other special occasions and events. While claims that this makeup will last up to 18 hours without showing signs of wear are debated, even detractors admit that airbrush makeup can last “all day.” And let’s face it — “all day” is better than previous options, and all day usually long enough! If you are considering it as an option for a special event in your life, scheduling a trial run in advance of your big day is strongly recommended, and any makeup professional should be willing to accommodate this request. There are two types of airbrush makeup available in home kit form: silicone and water-based. Water-based is lighter, and generally preferable for daily use, except when heavy sweating or exposure to significant moisture is anticipated. Water-based is preferable for oily skin as well. To maximize its application a setting powder may be used. Water-based applications tend to have a more matte finish and may dry out your skin. Silicone-based airbrush is more water resistant, even coming in some waterproof varieties, and is often preferred for special events that involve dancing or other physical activity that may lead to perspiration. There is a third type that is alcohol based, but it’s mostly used for special effect body painting and should never be used on the face. Airbrush has become common in television and for special events, so it’s no surprise that home kits are becoming increasingly commonplace as well. If you think you might be interested in trying airbrush makeup at home, check out this extensive pinkiou airbrush kit.It is beautiful and long lasting, and with a little research and practice, you can have the professional look you’ve seen on TV, every day. I got this site from my buddy who shared with me concerning this website and at the moment this time I am visiting this web site and reading very informative articles at this time. in the bottom of the front page http://www.pinkiou.com . there is an subscribe button. you can click and subscribe, thank you for your interests. When someone writes an paragraph he/she maintains the idea of a user in his/her brain that how a user can understand it. Therefore that’s why this article is perfect. Thanks! I simply want to mention I am very new to blogging and site-building and definitely enjoyed your web-site. Almost certainly I’m going to bookmark your website . You actually have beneficial writings. Thanks a bunch for sharing your web page.